When the series 7 trailer was released, one of the standout portions of it involved the Doctor and his companions Amy and Rory winding up in the American Old West. 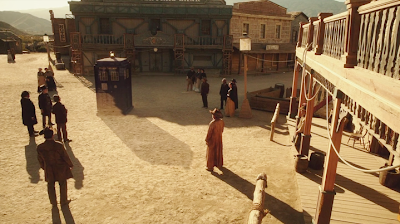 A locale that the Doctor hasn’t been to in quite some time and since this show is Doctor Who after all, it was a version of the West with a cyborg Gunslinger roaming about as the clear threat. But the real conflict wasn’t quite so cut and dry in this episode, ‘A Town Called Mercy’ and though it wasn’t one of the more thrilling entries in the recent Doctor Who canon, what it did give us was something that there should be much more of in Steven Moffat-run Doctor Who: one pissed-off war veteran. The actual town of Mercy lives in fear of the Gunslinger, so much so that they refuse to cross the city limits and enter into the desert. When the Doctor, Amy, and Rory land the TARDIS in the midst of Mercy they’re immediately pulled into the conflict as no time is wasted between then and the town's xenophobic attitude toward strangers. Town Marshall Isaac (Ben Browder with a mustache!) steps in to save the trio and welcome them into Mercy. They soon meet the reason why the townspeople knew what an alien even was as the town’s doctor is a alien refugee called Jex. He’s got a dark past and it’s going to mean life or death for the people of Mercy unless the Doctor can save the day. Even though it was fairly clear how the conflict would be resolved because of how Moffat's Who does things, there were still some bright spots worth mentioning. 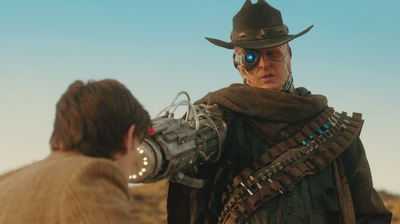 Namely the fact that the Doctor faced a bigger threat than a dangerous cyborg--he faced a fellow alien who betrayed the safety of his own people in the name of winning a war. Ah yes, wartime one of the Doctor’s most consistent sore subjects. In that regard, this episode gave us one of the most intimidating and unpredictably angry Matt Smith performances we’ve ever had the pleasure of seeing during his run. A common complaint about Matt Smith’s Who episodes is that he’s a pale shadow of the ferocity and the guilt carried by former portrayers of the Doctor, Chris Eccleston and David Tennant. It’s something that I’ve had problems with as well, but it’s episodes like this one which really reinforce the notion that Smith’s rubber-band limbs and goofy antics are one of the better masks the Doctor has yet worn to cover up his past regrets. When the right writer is behind the page it's clear that you don't want to make Smith's Doctor angry. which made me consider Matt Smith’s Doctor to be more in line with the acts of the ninth doctor and his Slitheen prisoner, or the tenth doctor and what he did to every last member of the Family then walked away from it. This felt more like the man he used to be and it’s a damn shame that Smith doesn’t get to tap into the Doctor’s epic rage a little more often—balance is key here and oftentimes he feels a little too non-stop quirky for the sake of being quirky. Quirk by itself is an exhausting character trait when there's nothing else to back it up. 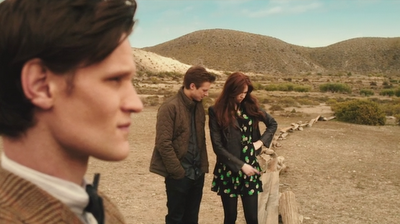 Something else that really stood out in 'A Town Called Mercy' would be the contributions of Amy and Rory. Namely, that they really didn’t need to be there. Sure, it gave Amy time to give a "we have to be better than them"speech as well as say the classic "this is what happens when you've traveled by yourself for too long' line. Though it might be nice if we actually got to see more solo Smith adventures outside of exposition claiming it's been ___ weeks/months since the Doctor has been with Amy and Rory. But when the Doctor was at his peak of anger she wasn’t even the one who managed to stop him and that usually means it's time for the Doctor to find someone new. Don't mind me, I'm just counting down the figurative days until we get more of the delightfully fresh Oswin Oswald by the Doctor's side. Right now it just sort of feels like, in this episode at least, that Darvill and Gillan were fulfilling the contractual agreement of how many final episodes for their characters they were to appear in. 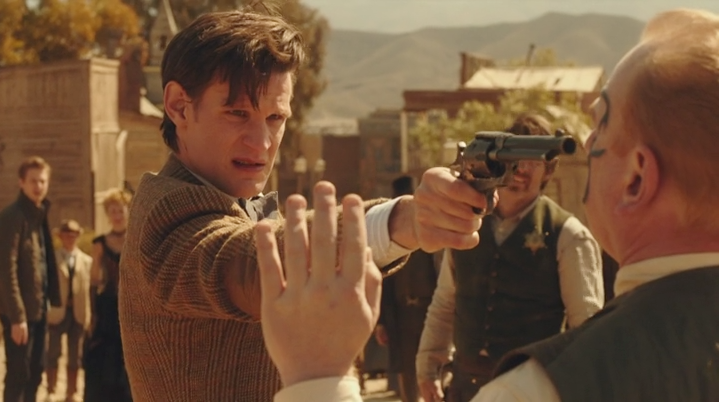 If it wasn’t for issues of guilt, resentment, and yes mercy being questioned within the episode then the majority of it would have seemed like a weak excuse to get Matt Smith’s Doctor back in a cowboy hat and on a horse. The episode provided viewers with another gorgeously shot locale as one could practically feel the desert sun bearing down on their face from the cinematography at work. Less impressive was the town of Mercy itself but then it’s hard to get the Wild West looking less like a backdrop at Universal Studios Hollywood. We’ve been doing a far bit of traveling so far in series 7 but next week’s episode ‘The Power of Three’ is bringing the threat home for the Doctor and the Ponds. Personally, I’m far more excited for this next episode as it’s been a while since there’s been a proper invasion episode in Doctor Who--they often wind up being some of the more interesting entries in the series. We're nearly to the end of this segment of the series even though we've barely begun and with next week's Pond penultimate episode I'm eager to see if we're heading toward the kind of companion departure Who fans talk about and reblog about for weeks to come.